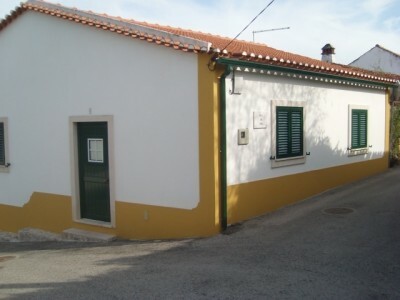 A two bedroom restored village house for sale near Torres Novas in central Portugal. The house, which is fully double glazed, is connected to mains water, electricity and sewage system. The cottage has stone window and doors surrounds and traditional style Portuguese shutters. The main entrance door leads into a an entrance hall with a tiled floor and partially tiled walls. Off this hallway there is a living room, also with a tiled floor. The kitchen is fully fitted with a selection of base and eye level built in wooden units, some of which have glazed panelled doors. The work surfaces are granite and the gas hob and oven are integrated. Within the kitchen there is space for a dining table. There is an exterior access door off the kitchen which leads out to the side of the house. There are two bedrooms, both of which have wood laminate floors. The bathroom is fully tiled and has a bath with a shower above, vanity basin with marble top and storage cupboard beneath, toilet and bidet. The property has a split level courtyard garden which is paved and has some shrubs, though there is space for a barbecue dining area. The house is situated in the village of Assentiz in central Portugal. There are neighbouring properties nearby, all of which have been restored. There are several cafes and a mini-market within the village of Assentiz and the larger town of Torres Novas is approximately 15 kilometres away. Torres Novas has supermarkets, shops, cafes bars, restaurants, a castle, swimming pool, health centre, schools and post offices as well as a historic centre with a medieval castle. The historic town of Tomar, which is home to the UNESCO listed Convento do Cristo constructed by the Knight Templars, is approximately 12 kilometres from the land. Tomar has a variety of shops, supermarkets, builders’ merchants, architects, schools and bus and train station. The house is easy to access and to locate. It is approximately one and a quarter hours’ from the closest airport, which is at Lisbon. Lisbon airport is accessed by several low cost airlines, which operate regular flights into and out of the United Kingdom.